Return to the skies and visit incredible destinations in this amazing sequel to the 2009 #1 app store hit game Airport Mania! Airport Mania 2 takes you on a journey like no other as you tackle airports from the North Pole to the Moon, and encounter a whole new set of aircraft including spaceships and military jets! You’ll also see some of your old favorites in totally new ways, like being retrofitted with pontoons for water landings! As with the first game, Airport Mania 2 was made to make you smile! Featuring a whimsical appeal that everyone who is a child at heart can enjoy, and intensely fast and challenging game play, Airport Mania 2 is your one-way ticket to fun! - Zany out of this world locations! - New Military Jets and Spaceships! - New challenging 4-Star scores to achieve! - Earn over 40 Awesome Awards! 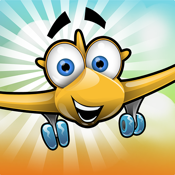 - Journey through 9 Airports and 79 Levels!